Why and How should we eradicate termites from our home? Termites can be a very destructive pest to buildings. The structural damage they cause to buildings costs billions of dollars annually to repair. Termites are usually referred to as “silent destroyers” because of the unseen damage they cause to wood, wallpaper or floors sometimes without notice. You may realize when it’s too late. Homeowners should seek termite services which are essential to eradicate them from their homes and avoid further damages. This article is going to look into the process of eliminating termites from your home. Some people prefer to use their own termite treatment methods at home maybe to save on costs but unfortunately, such options may not entirely rid their homes or buildings of this irritating pest. Some termites may be hidden from your view. Typically, they are small with termite sizes ranging from a quarter an inch to half an inch long. Remember, cheap is expensive, It is recommended that you seek the termite services of a pest control company. The termite treatment costs may be anywhere between 500$ and 5000$ depending on various factors such as the size of your home and the extent of infestation or damage. These termite control companies have trained specialists who have a vast wealth of experience in exterminating termites from buildings. Once you enlist the services of a termite exterminator, the trained professional will visit your home and conduct a thorough and extensive investigation of your home. They will check all the possible signs of termite infestation such as mud tunnels, termite mounds, hollowed-out wood, winged termites on windowsills, termite droppings. They will also look at wooden surfaces in your home, walls, floor or any structural conditions that attract termites. The inspection will determine the kind of treatment plan suitable for your home and the costs involved. The chemicals used to eradicate termites are called termiticides and the termite specialists will re-visit your home now complete with the necessary equipment to begin the termite removal process. The treatment options include the application of Liquid termiticides to the surrounding soil where termites thrive. Termite baits which take advantage of the fact that termites like feeding on materials rich in cellulose such as paper, wood, cardboard. By infesting these items with cellulose baits containing an insecticide, the termites can be eliminated. Once the termite control specialist completes the treatment, the homeowner will be advised accordingly on how to monitor any termite activity. The pest control company may conduct another visit without any extra charges to guarantee the complete extermination of the termites. So now you have learned the three major steps to exterminate termites. These creatures can cause extensive damage to your home. You can imagine the costs you will incur repairing certain sections of your house. But you don’t have to wait until all that damage happens, you can contact a pest control company in your area. 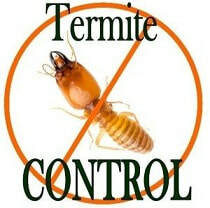 They will gladly visit your home, conduct a thorough inspection and eliminate any termite infestation. It’s worth your money, so don’t delay.